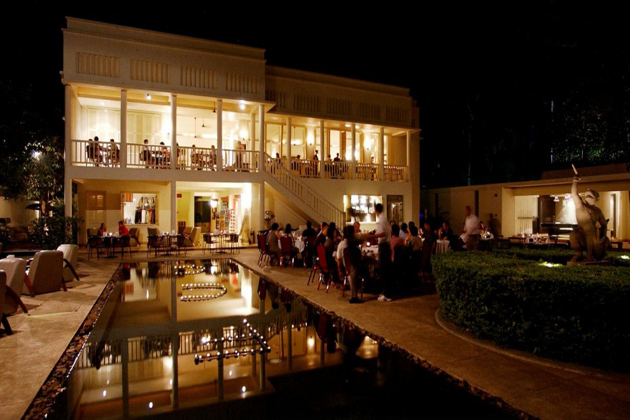 Siem Reap has not only mysterious temples but also many exciting activities at night. You can go to the night market, sample unique dishes such as fried spiders, scorpions … Or simply drag all your friends into bars and enjoy the bustling atmosphere around you. 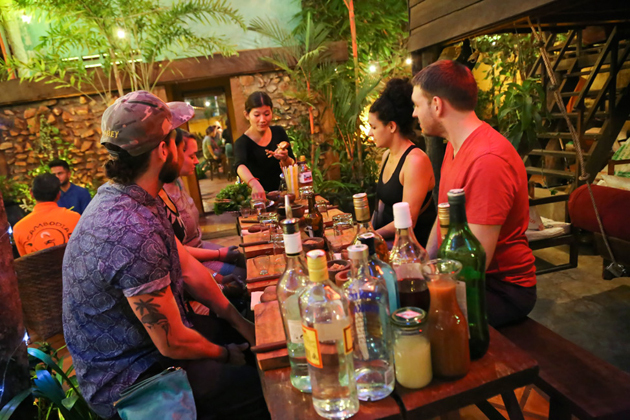 With the entertainment until 4 am the next morning, surely the list of 9 bars will be the perfect choice for the night of fun in Siem Reap tours. 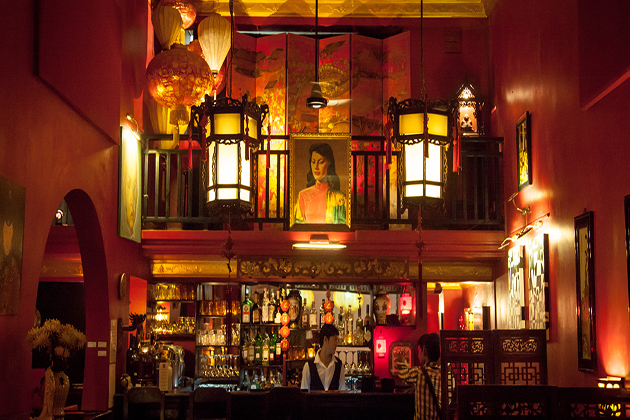 This bar can be easily recognized through its beautiful red lanterns. Miss Wong Cocktail Bar mainly serves the best alcohol as well as beverages in town with Oriental recipe and tastes. Most are mixed drinks with gin and beers imported from around the world. This is a great opportunity for you to taste a variety of different beers (if you are not afraid of being drunk). The price for each beverage is about $ 5, not too expensive nor too cheap compared to other places on this list. 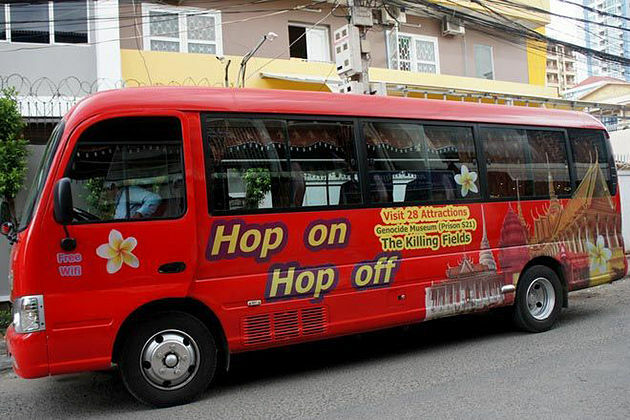 FCC Angkor owns enough facilities to accommodate all travelers from indoors to out. You can choose your favorite place, on the sofa in the room or by the cool pool. Along with the spacious and airy space, FCC food is one of the factors that make the place famous. 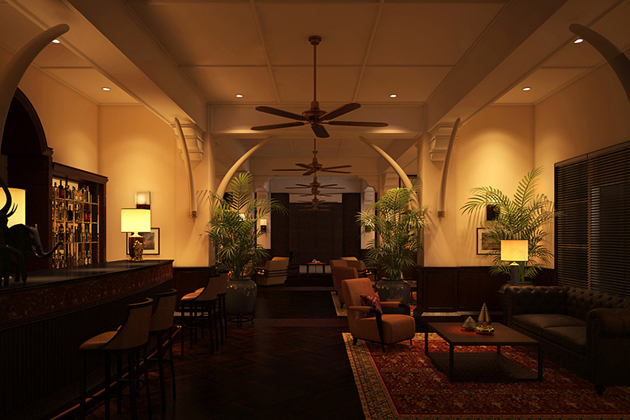 The bar located on the Raffles Grand Hotel d’Angkor is considered as a small Siem Reap. With its elegant colonial architecture, dark wood furnishings, leather sofas, and ivory décor, this bar is luxurious from every angle. Compared to most bars in Siem Reap, prices at the Elephant Bar are quite expensive, but if you want to try the feeling of being a “big hitter” one night it is extremely reasonable. Asana will not give you the feeling of a typical bar you often imagine. In contrast, this place brings the feeling of an old-fashioned house in the countryside. With wooden architecture and decorative details are “rural”, you will feel quite comfortable when entering. You can choose upstairs and relax on lazy chairs. 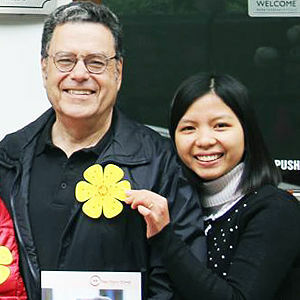 Or go out to the garden and join the BBQ party in the cold evenings. The music is somewhat soft with the smooth blue and jazz. There is also a Khmer cocktail class for those who are curious after trying this drink. The class is held every day and costs about $ 15 (which is quite expensive if compared to the general drink but worth trying). This bar is famous for keeping up with trendy entertainment trends. Besides, the crazy music played by talented deejays will completely make most of your energetic night. Parallel to that is the drinks and food at a relatively cheap price. 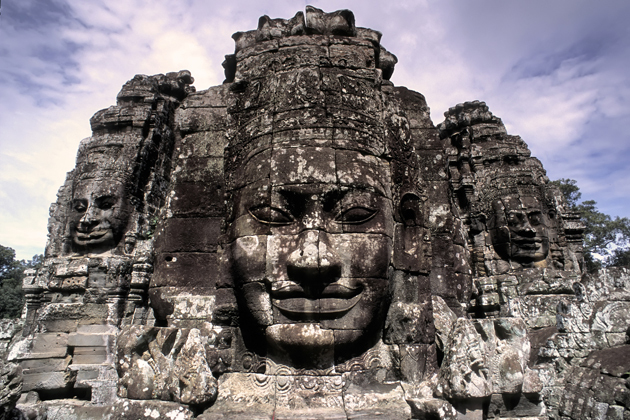 If you are in search of the amazing experiences and feelings, note Mezze in your itineraries of Siem Reap tour. 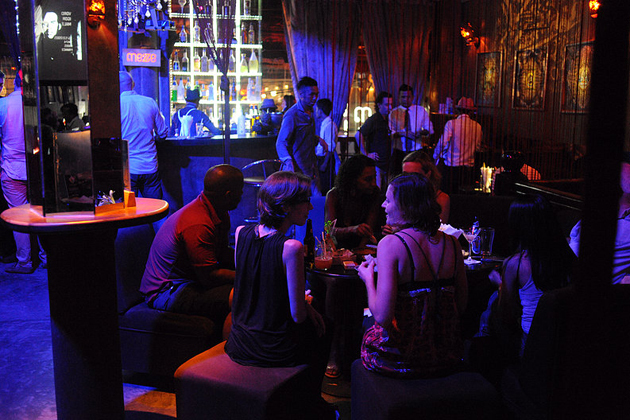 The Picasso bar is a good choice if you have the desire to make friends with friends from around the world. Although the space of this bar is not luxurious, even somewhat normal, Picasso owns a variety of delicious drinks from Singha – the national soul of Cambodia, to the cocktail, sangria, and martini. The special drink here is a drink called B53, which includes the Kalua coffee liqueur, the Bailey milk alcohol, and the Absinthe, a spiraling alcoholic beverage. There is also a cocktail called Chocolate Cake, which is made from Frangelico and vodka in crystal clear glass jars. Entering this bar you will not believe it was opened 20 years ago. As one of the first open shop on this road, today Angkor What? is still extremely hot. 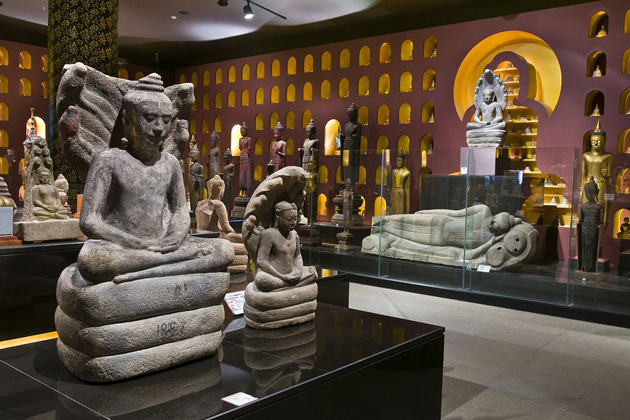 You will be immersed in a jubilant, exciting space with visitors from all five continents and four seas. Your energy is filled up by the best kinds of alcohols and beverages to “rock” throughout the night. 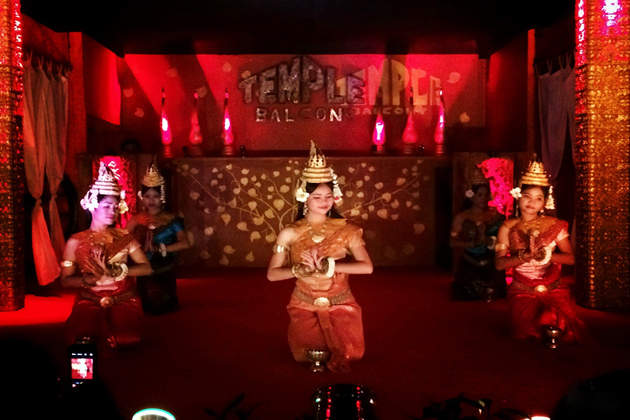 The state-of-the-art bar is absolutely the great place to enjoy the traditional Apsara performed by outstanding dancers. Inside the space quite comfortable with lazy chairs, neon lights full of a color and warm atmosphere. You can enjoy the traditional dance performances from 19:30 to 21:30 every day. In addition, you can also mix into the exciting atmosphere is stirred by the DJ playing music overnight. 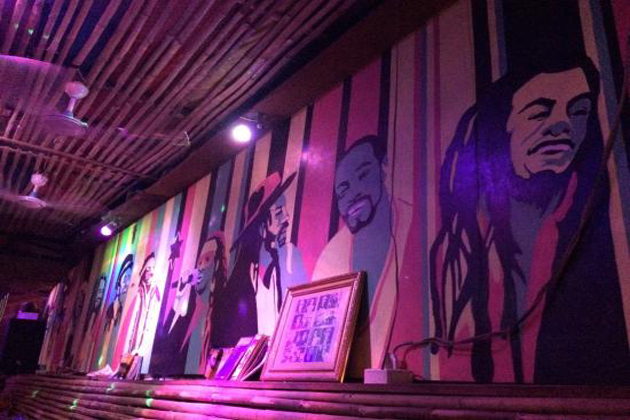 Soul Train Reggae Bar is one of the new bars on the “road of fun” of Siem Reap. However, this is not to say that this restaurant reduced the hot with both indigenous and four-way tourists. 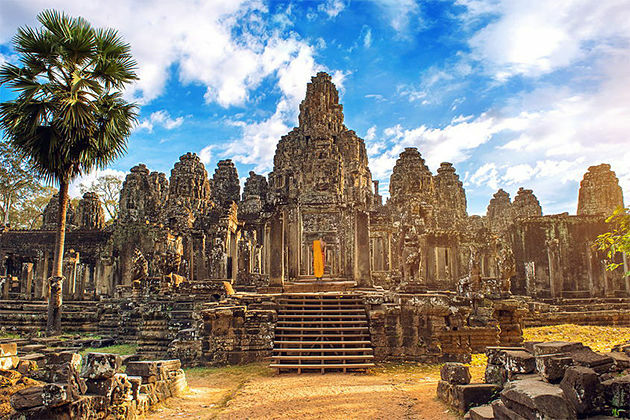 The space here is Mediterranean style from food, drink to air and music, STG promises to bring you from Siem Reap mysterious to the hot Mediterranean land. 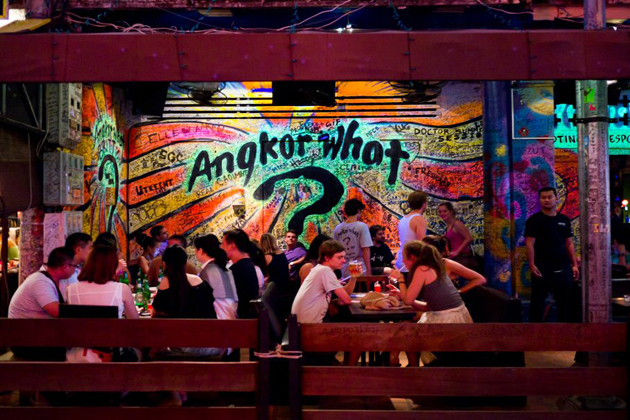 The most vibrant venues of nightlife in Siem Reap is Pub Street – a vibrant street with full of friendly backpackers. There are always restaurants, massage parlors, and retail outlets. It is very great for dancing and walking, this bar is opened up to 4 am. Wine is also available at Pub Street – it will cost at least US $ 1 (or less) for a tip of beer during the promotion period. 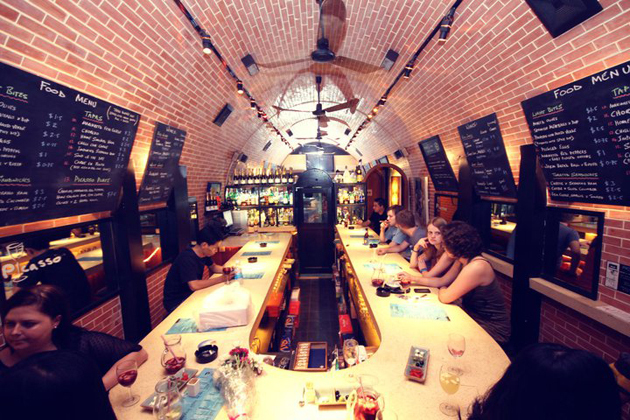 In addition, hotels, bars, lounges, and pubs are popular, where rich people can enjoy imported and traditional wines. The space of the bar is divided into 3 layered floors outfitted with tall tables, low tables, and armchairs. Tourists are welcome to take a sit and listen to music and songs from singers. Amazingly, the music from resident artists are not a mind to the guests, instead, they prefer respite for those who want to relax with soft music after a busy day. The bar attracts tourists from the first sight with a spectacular colorful peacock decoration, besides dozens of food and drinks, which make tourists confused to choose. The green panting structure is reflected from the lights in pink which is set at the peacock’s plumage attracts patrons to the core column in which displayed a great number of wine bottles as layers on the bar, guest tables are full of tourists sitting and sipping on cocktails. The tail of the peacock made from iron by a Khmer designer is appreciate by guests as workman’s evident skill which has made the Sky bar become a unique addition to Siem Reap. Patrons come to the Moon Sky Bar love a green colored house cocktail called Pretty Moon, which costs $25 for three liters. Another drink named Five Color Syringes costs $8. 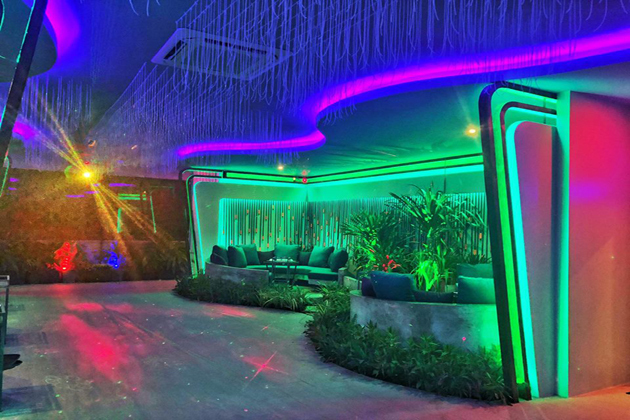 In fact, Sky Bar is also a home for a range of drinks and food from Khmer fare to Chinese and Europen cooked at its kitchen on the second floor. Seyha said that Patrons love their Lamb Chop ($12.50) which has reasonable price and delectable. 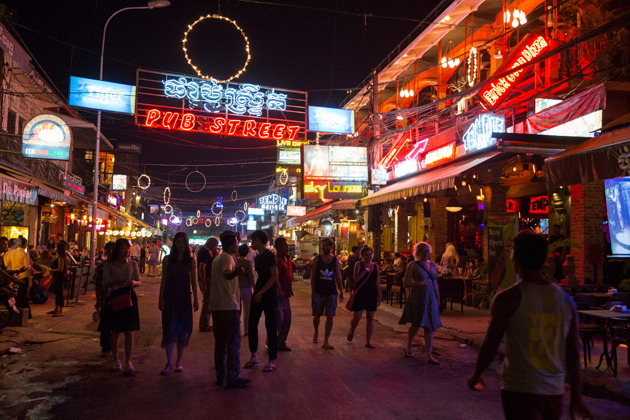 Siem Reap may not be famous for its nightly streets such as Bangkok Thailand but not so quiet. If you have an opportunity to come here, enjoy yourself in the noisy night air, make sure you will be surprised by what you experience.